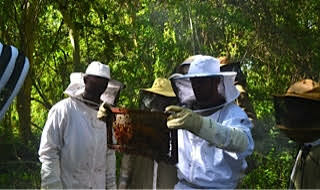 Beekeeper training is one of the main goals of Tree of Life ltd. Tanzania. The heart of the organization is in helping local people get a broader picture of how to use renewable natural resources to increase their income at the same time improving their eco-system. Beekeeping in Africa requires attracting swarms of bees to your baited hives, monitoring and providing a good environment for them to thrive, and learning how to harvest, utilize and market the beneficial products of the hive. There is a HUGE local market for good honey and raw bees wax. 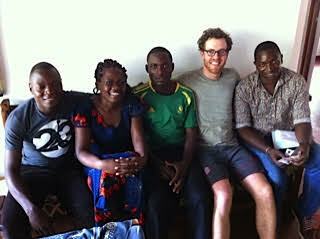 Felisto, Amina, Kessy, Henrique and Prosper came to our apiaries in the Rukwa valley to attend our November 2015 training. 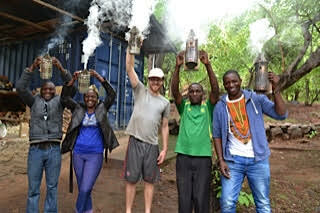 These young, influential people reflect the future face of beekeeping for the continent of Africa. 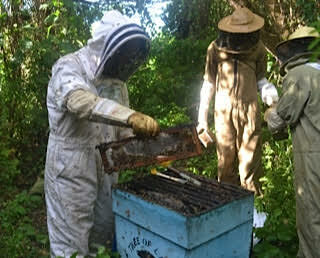 November 25th-29thof 2015 found us training beekeepers again in the Rukwa valley of SW Tanzania. We had trainees come from Wildlife Connection in Ruaha National Park, Lima ltd. from Mbozi, and Kilimo Timilifu from Lindi district, a young man named Henrique from MANI a Senegalese NGO, as well as local attendees from Rukwa region. The attendees had great questions and worked well together. Bwana Eliamu Mulungu a member of the Tree of Life board is also a chef and cooked outstanding meals for the whole crew in spite of the remote location! As usual the first day was dedicated to Theory (what is a colony of bees and how do they interact with each other and their environment), second day Practical (Smoke and its effect upon a colony, making wax starter strips at home, proper clothing for beekeeping and then actually harvesting honey together in the afternoon) and the third day Processing and Packing (quality honey in attractive containers so as to attract a local market). Micah, Prosper and other attendees examine a mixed brood-honey comb looking for the queen during our day of practical training. Everyone knows how to light a smoker, right? Smoke is extremely important as it calms bees and interferes with their ability to communicate. Almost all of the attendees decided to order bee suits, smokers, and hives to take back home to have local tailors and carpenters copy. 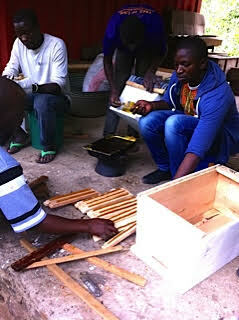 The use of top bar hives was “focused on” during the training, due to the low cost of producing them and ease of harvesting. The natural progression of moving from the traditional “fixed comb” log hive to top bar hives and then if applicable finally to a type of Langstroth hive cannot be over emphasized. 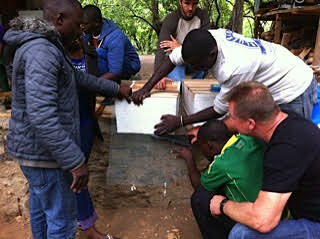 Trying to move African beekeepers too quickly along this progression can lead to frustration. 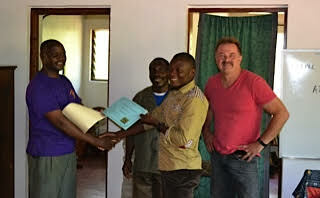 All attendees received signed certificates with a raised seal from Tree of Life ltd. upon completion verifying that they have completed a short course in African Beekeeping. Felisto receiving his attendance certificate from the Secretary of Tree Of Life ltd. Jericho Mugalla and Chairman Eliamu Mulungu. 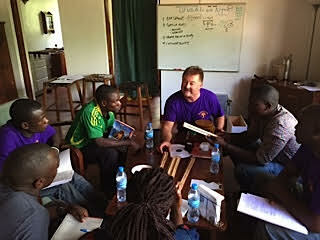 Ted working with the trainees during the “Theory” portion of the training. What is a colony of bees and how do they interact with each other and their environment? 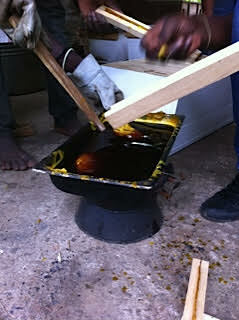 Melting bees wax to make “starter strips” for top bar hives. Baiting hives with “starter strips.” These strips of bees wax help guide bees in the building of their comb so that your hive will be “organized” to help the beekeeper. 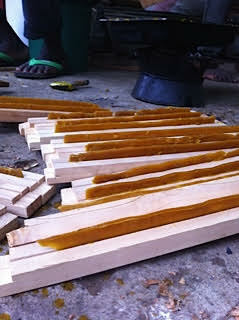 Baited top bars with bees wax strips. Preparing a queen excluder from locally purchased coffee wire. It takes only 2 minutes to prepare such an excluder. This devise limits the queen to the brood chamber allowing the harvesting of pure honey devoid of brood in the rear of the hive. 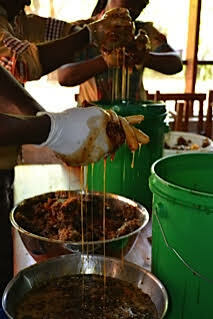 Harvesting honey in Lyanza. Notice the beautiful, white beeswax. 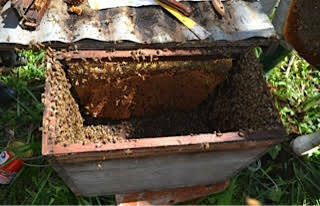 Beginning of the “brood comb” after harvesting the honey. This is a sign that there is a strong queen present. After cleaning the comb the attendees press the honey from the comb. Afterwards, it is run through a rough filter and put in a settling tank for 24-48 hours to “purify” itself before bottling. Food grade gate valve. This is a very important item if you are using a settling tank. Honey is heavier than any detritus in it. Therefore after 24-48 hours the opening of this gate valve will let pure honey flow into your containers. 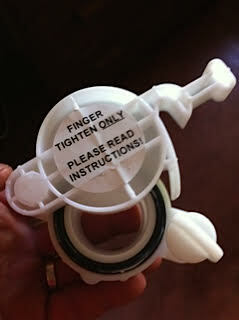 These are easy to “cut” into your settling tanks.